Let PROMOLUX Lighting International support your commitment to delivering fresh dairy products. Promolux specialty food lighting in your dairy displays can help keep the appearance of your milk, products and cheese appetizing and your store sales brisk. Safe Spectrum lighting by Promolux brings full balanced lighting to your dairy display cases. In addition to illuminating fresh dairy products in the best natural looking light, Promolux Safe Spectrum lamps produce lower levels of both ultraviolet and visible spectrum radiation. As a result, Promolux lighting reduces problems of reduced quality and shortened shelf life in milk, cheese and ice cream arising from lipid oxidation and damage to colors, textures and flavors caused by light. In as little as two hours of exposure to regular in-store dairy display case lighting, the fat in dairy products starts to become rancid--a photochemical reaction known as lipid oxidation. Cream and milk both lose nutrients in this process, including riboflavin and vitamins A and D, and can develop unpleasant metallic, cardboard, or burnt flavors. While many dairy products are now sold in opaque packaging to prevent lipid oxidation, transparent containers are more effective for marketing purposes. How photo oxidation degrades milk has been demonstrated in numerous studies on the effects of natural light and fluorescent lighting in food displays. 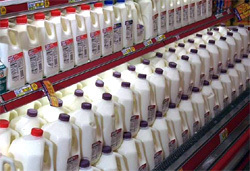 Milk loses flavor under conventional fluorescent lights and also suffers nutrient losses, including the degradation of riboflavin fand vitamins A and D. Oxidation damage is more common in milk packaged in transparent glass or plastic, though it can also occur in milk contained in paper cartons when light is intense and the cartons sit for long periods of time. Even though cheese is light-sensitive, it is often packaged in clear wrapping. The effects of light on cheese are most noticeable in changes to the color of the cheese: the portions that are protected from light, such as the bottom of the block or the part beneath the label, are often darker than the portions of the cheese block that are exposed to light. With prolonged exposure, orange cheeses will turn pink and develop off flavors. 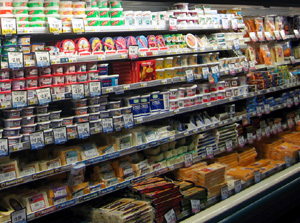 Unwrapped cheeses in self-service display cases, such as feta, are extremely sensitive to lipid oxidation. When exposed in this way, feta develops off-flavors and turns yellow. Ice cream is doubly affected by poor dairy display case lighting. When exposed to supermarket fluorescent lights, fresh ice cream flavors and texture are easily damaged. Heat and radiation from regular supermarket fluorescent lighting can also cause the top surface of ice cream to melt, separating the water in the ice cream from the other ingredients. When this water refreezes, ice crystals form in the ice cream. Why Promolux for your Dairy Display Cases? Safe Spectrum lighting is food safe balanced spectrum light and is designed to improve the marketability of perishable goods in two important ways: by reducing the levels of harmful wavelengths of the color spectrum and by minimizing damage to foods displayed for sale to the public. Natural colors remain true with Promolux supermarket dairy lamps because they have a more balanced visible spectrum than other fluorescent lamps, including more of the red and blue wavelengths, and more moderate levels of the most damaging visible spectrum wavelengths, yellow and green. Promolux retail dairy lighting also emit lower levels of ultraviolet radiation and heat than other commercial lighting commonly found in grocery dairy departments, making these specialty dairy display case lamps the perfect lighting choice for the retail dairy industry. Click here for more information about PROMOLUX low UV dairy lighting. © Copyright 1998- 2019 Market Group Ventures Inc. All rights reserved.